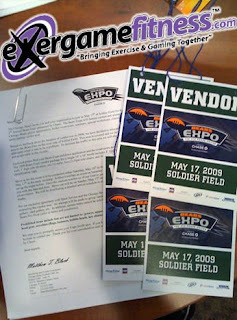 Come out to the Expo to help kick off the 2009 season with the Chicago Bears and the 4th Phase. Be sure to check out the autograph sessions, seminars (featuring players, coaches and front office personnel), locker room tours, Q&A sessions, kids interactive area, field activities, authentic Bears merchandise, participating vendors and see first hand the ins and outs of the best stadium in the NFL, Soldier Field! The 2009 Expo seminar schedule will include Inside the Bears, Bears Q&A, Meet the Coordinators, Football Tales, Game Time Equipment, Meet the Rookies and more! Also on hand will be Exergame Fitness USA, This videogame exercise company will be sponsoring the Bear Expo by bringing thier “Active Gaming Products” such as the tWall (digital interactive touch wall) and a USA Made Wii Multiplayer DDR System for all to enjoy! Exergame Fitness is the global leader in exergaming products and services that help fight the raging epidemic of childhood obesity and inactivity.